The department store is in the midst of a major turnaround, and the stock is producing impressive gains for investors. J.C. Penney (NYSE:JCP) stock has been firing on all cylinders lately as shares of the department store chain have gained nearly 50% year-to-date on the back of encouraging prospects for a sustained turnaround. Let's take a visual tour of this company and what these positive developments could mean for shareholders going forward. With the turnaround, management has been betting on private-level brands, omnichannel technologies, and an expansion of the Sephora in-store concept. These initiatives are generating visible results, and J.C. Penney is outperforming the competition. 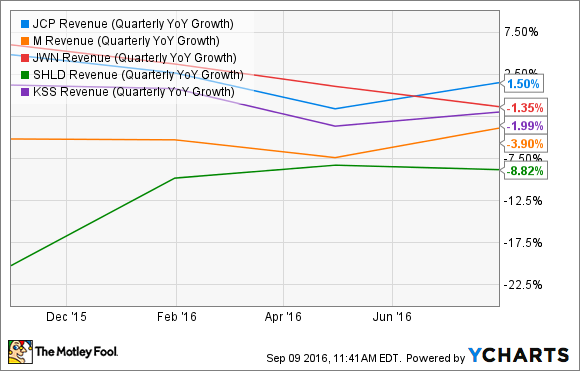 The following chart shows quarterly revenue growth for the company versus major competitors, including Macy's, Nordstrom, Sears, and Kohl's, over the past several quarters. J.C. Penney is not only beating its peers, but it is the only department store in the group that reported positive sales growth in the second quarter of 2016. Looking at comparable-store sales, the difference becomes even more apparent. J.C. Penney delivered a 2.2% increase in comparable revenue last quarter, while its competitors all suffered declines. The retail industry is notoriously competitive, and brick-and-mortar operators are facing significant pressure from online stores. The fact that J.C. Penney is managing to deliver growing sales, while most of its peers are struggling speaks particularly well of the management team and its turnaround efforts. Due to this competition, many department stores are resorting to pricing discounts to protect sales volumes and boost foot traffic. However, this is squeezing profit margins across the board, and J.C. Penney is not immune to this trend. Management is expecting some pressure on gross profit margins in the second half of the year due to weakness in the online channel. Nevertheless, the company is still boosting profitability on the back of leaner inventories and an improved merchandising strategy, while also reducing corporate overhead and advertising expenses. As a result, management is expecting a sustained improvement in earnings and cash flow going forward. Earnings before interest, taxes, depreciation, and amortization (EBITDA) during the second quarter came in at $229 million, a 59% increase year-over-year. This number has substantially improved over the last several years, from its negative $641 million low in 2013 to to a positive $715 million in 2015. Even better, management is forecasting $1 billion of EBITDA for 2016 and $1.2 billion in 2017. J.C. Penney is also restructuring its debt obligations to increase financial flexibility and reduce interest expenses. The company recently refinanced its $2.2 billion real estate-backed term loan due in 2018, replacing it with a $1.7 billion term loan and a $500 million fixed-rate secured bond, both maturing in 2023. All of the company's debt now carries a fixed interest rate, and management calculates that these financial maneuvers reduced annual interest expense by $24 million. The company is planning to allocate approximately $450 million per year to capital expenditures from 2017 to 2019, spending most of it on stores, omnichannel technologies, and the supply chain. Still, management expects to generate nearly $300 million in free cash flow during 2017, and it predicts that figure will rise to $400 million in 2018 and $450 million in 2019. Under such a scenario, free cash flow would be more than enough to cover debt maturities over the coming years. Importantly, J.C. Penney stock still has more room to run when considering both margin improvements and valuation. The following chart compares operating profit margins and price-to-sales ratios for J.C. Penney and its previously discussed peers. With the notable exception of Sears, which is producing big losses and trading at distressed valuation levels, other companies in the sector generate much bigger profit margins than J.C. Penney, and they also trade at considerably higher valuations. Data source: FinViz. Chart by author. If management can boost margins to come in line with those of Macy's, Nordstrom, and Kohl's, this could drive a substantial appreciation in J.C. Penney stock from current valuation levels.